I finally just received my huge order of oils and herbs from LM. Among the products I have blockbuster oil and block buster herbs and I have couple of questions on how to exactly use them. I mainly want to use block buster because I feel stuck when it comes to my career and school, I feel there are so many obstacles and I want them gone. 1-Can I bathe with the oil or herbs and in which way? If so is there anything that I can recite while bathing with the oil or herbs? 2-can I anoint a candle with the oil and put a petition paper under it? 3- what should I put in the period paper and what color the candle should be? 2 - Definitely, that would be great work in tandem with the bath. 3a - The petition paper is personal and should reflect your own needs and desires. ''Remove all obstacles and blow the blockages in my work and school life.'' or ''I can (fill in the blank here), (fill in the blank here) has been removed and blown to bits and out of my life.'' are different ways of wording this. Getting Miss Cat's book ''Paper in My Shoe'' on petition writing is another great way to inform yourself on how to best write your petitions depending on the situation. You could also check out the forum thread devoted to petitions. 3b - I prefer Red for this type of work. Aura has given you some great advice, and I do invite you to read through the Block Buster page for more insight and use of this fantastic product. Thank you aura for your advice, it answers all my question. you can but block buster kind of blows things open so I dont think it fits with the work, I would do one seperatly to the return to me . Like come to me to the open paths (rec) open my paths to john doe ( road opener). I would light a blockbuster first to blow away the obstacles in your path. THEN, on to your next candle! Okay would anyone be able to give me the link to order the Blockbuster products? and could you also tell me if we are allowed to open up the petition that we have created with all of the pins and sachet powders and oils in it to add more junk from the people's home? If your petition is already dressed, then just make a new petition paper. Okay, I'm confused...I just read through the Blockbuster Spell and its a REALLY great spell I am SOOOO gonna try. But it states to lay down a piece of waxed paper or aluminum foil on a cookie sheet and sprinkle your leftover wax shavings...wait, what leftover wax shavings? What are they leftover from? I was thinking the shavings from inscribing the candle; however, the whole inscribing of the candle part comes after that. So where are these wax shavings coming from? If you have wax shavings (that you can scrape from the bottom) before you start the spell. That is your option. Oh, so I should just scrap and scratch off a little wax from the bottom of the 9inch candle? I can do that! Thanks for clarifying!!!! One last question about that spell...it says to dispose the remains in a crossroads in four directions. So should I keep the remains loose and toss a handful in four directions or make little individually wrapped bundles of remains? I usually put my remains in aluminum foil (shiny side facing in) and then wrap them in either white fabric or black fabric, and tied tight with a either a black string or red. So four little bundles tied tossed in each direction or loose and tossed? I would make 4 little bundles but just wrap them in cloth. Yes, just scrape some wax. Hi everyone I'm just wondering whether i could set up a block buster lamp. I have a red one and I thought I could possibly set one up to run constantly. Using the herbs and oils from the LM Block Buster range. Place my petitions inside the lamp well and just let it constantly run. I am currently doing a Block Buster spell with the 9" red candle. But I was wondering if I could have this lamp running afterwards to keep busting blockages as I do my other spells. Ie money drawing, success etc. Please keep us posted on the progress and results. I may try that myself! Thank you Miss Aida I will definitely let everyone know, of any significant happenings. Ask I'm sure most people know, I'm on a campaign to get my ex back. I'm already working a honey jar that I'm planning on adding some herbs to once they come in (most are for openjng communicstion, reconciliation and attachment) as well as oils go the same things. Three days into doing my honey jar I noticed signs and I've been working on it for about three weeks now, and still no major movement... I Know my target is very stubborn and he believes that we're not good togrther at this point in our lives and all of my dreams have shown us on the precipice of making up and it seems like he wants to get back together with me (again, in dreams), but something keeps holding him back. I'm still planning on doing a skull candle to put the thought that he misses me in his head as well as moving figure candles afterwards, but should I also work on getting rid off whatever blockages may be there? Should I do this before starting my skull candle, or can I do it after that, before I start my moving figure candles? I always do the Blockbuster first. Complete the spell and then proceed to the others. The only exception that I make to this is when we are doing an uncrossing. Then, we perform the blockbuster afterwards. Thank you Miss Aida; I'll pick some up when I can make my next order! I believe wednesday is the day you are looking for. But in the end, its really up to you and what day YOU feel is strongest (if any) in breaking through your obstacles. But I personally refer Mondays. But, that's just me..
@Nidia- that is so funny, because I was looking at different days of the week this work could make sense. I looked at Saturday - because Saturday could be useful for adding or removing blockages. I also looked at Sundays, to clear away obstacles and new beginnings. I also looked at Tuesday's, because it is another day to remove blockages and hard obstacles in your way. I also looked at Wednesday, for the day of communication and new beginnings, also for clarity and clearing the road. (Basically). @Aida- OH YESSS! I would of never thought? Well I have many options. Lol. Again, its all about preference. 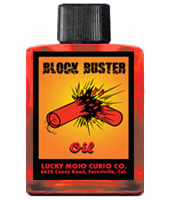 What type of scent does Block Buster oil have? I am HORRIBLE at identifying odors. 4 days ago I did a BB spell for my career, and also my targeted love, cause readings say she loves me but she blocked me due to complications, it's long distance too. I was wondering how long do I wait before doing a follow up spell on both situations? rookieguy13, you should probably be doing some work along with the Blockbuster right away. If I do work to open the way for whatever, I jump right in with something specifically designed to draw what I cleared the way for, in. Personally, I work Blockbuster first and as soon as that work is completed, I move on to working on whatever it is I want to clear my path towards. I would work in sequence like that. I would love to have a blockbuster vigil light set for me BUT I'm very afraid, because of the wording that says it doesn't care what's holding you back it will bust it away. I know my daughter is the reason I'm having problems finding a job because she's only a baby and I spend most of my days doing things with and for her but I REALLY need a job fast. I am afrai if I work with blockbuster something may happen to her. Sorry if I sound pathetic but it sound like just the candle I need but without the busting every and each thing in my path. A follow up on the block buster vigil lamp I put together about six weeks ago. Initially I set it up as a helper light for my block buster candle spell I had prepared, but however, due to personal reasons, I could not do the actual spell as Miss Cat describes on the LM web site and unfortunately still haven't However all I can say is wooooooowwww within a couple of weeks there were explosions lol occurring in my life ... At first I was left dumbfounded as to what was going on then I put two and two together. I might not have done the spell itself just yet ..but obvious obstacles were being blown up around me and I will tell you from my experience so far that block buster definitely doesn't care what debris it leaves behind and that's just the vigil lamp that I have kept going since August. I am doing the full spell tonight. I will keep everyone informed. Hello everyone I need expert advice. I did the blockbuster candle spell yesterday as outlined by Ms. Cat on her web site. Now my problem is the way the candle burned. It burnt ferociously. I know that candle divinations aren't given here on the forum but I just need some advice. Like I said the candle burnt ferociously with little explosion like sounds whilst burning. There was so much black smoke I had to take it outside the flames enveloped the whole ceramic jar I was burning it in however it did not crack the jar or burn the tray I had it sitting in nor my picture and personal concerns that were placed underneath the ceramic container. The flames left nothing of the candle or the herbs. They were burnt to a crisp. The whole ceramic jar is covered with black soot however by the time it finished burning the black smoke turned to white and only white smoke was puffing out. I was a bit concerned and I did a reading as to whether I should re do the candle in case of blocks left behind ie all the black soot in my container my reading however told me that I don't need redo the candle. Do you know WHO was working against you so hard and WHY? You may want to do some protection work, or maybe work a skull candle so they forget about you. Just a guess .... take care. The candle burning fast and furious suggests that your candle was working hard for you, but the black soot in the remains indicates some obstacles to success. I would do another candle and see what kind of results you get. It won't hurt, and can only help. Thank you both MoonBreath and Miss Athena for your prompt replies. I will cleanse again and up my protection for myself and my family. Your thoughts are exactly what I thought when I saw the candle burning. I will re do it as soon as I get my products from LM. I ordered them as soon as I saw how the candle was burning. In actual fact i have refrained from putting this person in a mirror box and burying it in the grave yard but it's high time they got a taste of what they send out to continually hurt me and my family. I've done and uncrossing love for my boyfriend. He said he needed space to figure himself out in order to be the person he know he can. I said that I would give him the space he needed, since I am not taking any of it personal. He has some issues that he needs to figure out and I understand that. Communication is however open, and we have been texting everyday, not much, but at least the communication is open. Since I know his issues, I performed an uncrossing spell on sunday on a double side black and red jumbo candle ( I used jinx remover oil, I didn't have the uncrossing oil) I hope this is okay, (please let me know, so I can perform a new spell with the right oil), uncrossing herbs (rose petals and rue). I added a triangle of salt for protection and placed 3 black small candles dressed with fiery of wall in each point. The candle burned pretty fast and left no residue, the flames consumed the entire wax. Is this a good sign? (I hope it is). 1.Can I burn it in sections starting tomorrow than on Friday I can leave it on to consume entirely or does it have to be in 7 days? 2.Can I also add blockbuster crystal in to his laundry? 3.Can my petition in the candle say "remove all blockages that are preventing( X name) from loving me and committing to me" or should I add my name as well? 4. Can I write one than more petition in the candle. I was thinking also scribing "remove all the blockages from past hurt and fear that are preventing (his name) on giving himself to me (my name). 5. Can I also have a paper petition under the candle and his photo? 6. Any time in specific or can perform the spell at night around 9 or 10? 7. I have some of his facial hair, can I add that into the herb mix when I make the candle or where should can I add the hair, or no hair at all? 9. Not sure what other spell I should follow with this when the moon is waxing and before mercury goes retrograde. Any suggestion? I have a honey jar going and I always have a vigil candle white or red with love herbs for back up. But I am specifically asking for a spell? road opener, marriage? I can't find a good marriage spell? I have some LM spell kits such as come to me, Return to me and reconciliation. I've already reconcile so maybe i don't need the last one anymore? I also have a lamp with with red fluid, any suggestion on what to do with that one? perhaps adding herbs in it and placing a photo of him underneath the lamp? Thank you all for the time to respond not just me, but to everyone in this forum. Your help is very appreciate it. That's fine with the Jinx Removal. Do not ask all these questions under the blockbuster thread. Your other questions go on the appropriate subforums and threads. Hi there! Has anyone used blockbuster oil with reversing on a double action black/red candle? My relationship is constantly being thrown at. I've worked a mirror box on my enemy as well as reversing and banishing spells but he is still able to influence my relationship. I wear a mercury dime and have protection jars that I work for my boyfriend and I.
I am thinking of lighting the black/red double action candle dressed with blockbuster, reversing and stop gossip on the black side for my enemy and on the red side reversing, adam and eve and victory oil for my boyfriend and I.
I would instead light a blockbuster candle first (and by itself). Then, follow up with your spell (without the blockbuster oil). I do not believe it would be redundant, and it certainly would not be harmful. You were planning to do the work when you first had MISC set the light. I would continue with that plan! I am waiting on my Blockbuster supplies and am doing a bit of reading here, in anticipation, prior to doing my spell . I have a question regarding the shavings from the bottom of the candle which you described to another forum member as "If you have wax shavings (that you can scrape from the bottom) before you start the spell. That is your option." - When scraping the bottom of the candle, just how much am I to scrape off? I'm assuming anything that would significantly shorten the burning time is too much. - Also, just curious, why do we scape wax from the bottom of the candle usually (outside of purposes related to heating and rolling the candle in herbs)? My statement is out of context. The forum member that I had answered had a particular problem. I wouldn't scrape the candle as a general procedure. So, in order to clarify, when doing the Blockbuster Candle Spell here: http://www.luckymojo.com/blockbuster.html, where should the required "leftover wax shavings" come from? Just wanting to be as prepared as possible in order to follow the directions as closely as possible. In addition to Block Buster Oil, the spell you cited calls for "a small amount of left-over wax, cheese wax, or beeswax sheet." This is NOT wax scarped from the Jumbo candle you are about to fix. It is, as stated, "left-over" wax or "cheese" wax or "bees" wax. Left-over candle wax would come from other candles -- from what you may carve away when loading, inscribing or carving other candles, or from candles that left behind dripped remnants that you deem suitable for re-use. Cheese wax would come from a waxed cheese (purchased to eat). Beeswax sheets can be purchased from an apiary supply company. You can also buy them at a very high price from some craft supply stores -- but apiary supply outlets are much more economical. Most of us who do this work keep such things around. Fantastic! I do, in fact, have leftover wax from past candles (which are also related to what I'm using the Blockbuster for!). I began my Blockbuster work last and I am very excited. I followed the instructions "to the T"! I will say, the candle burned pretty fast; The 9'' jumbo candle has burned down almost completely, after I lit it yesterday around 7P and burned it throughout the night. Very steady and high flame throughout the entire night. Hello all! I'm going to be working a blockbuster spell and I had a question about the burning time of the jumbo candle. 1. How long does it usually take to burn? 2.Can I do 15 minute burnings instead of the long burn? I have small children in the house and I would prefer not to leave a candle burning over night. The LM website sys that it takes 9 hours. But, it has always taken me 24 hours for any jumbo candle. So, 15 minutes at a time will take you forever.